Environmental transformation of engineered nanomaterials makes it extremely difficult for us to track them under natural conditions because their identity and the related properties are changing constantly. Therefore, much research is being conducted, simulating natural environmental conditions, to understand these nanoparticle transformations and the subsequent behavior. One such parameter which is constantly under investigation is the effect of sun light or more specifically the visible (400-700 nm) – lower energy UVA light (300-400 nm). Since higher energy UV-light (UVB and UVC) is efficiently absorbed by the ozone layer and the atmosphere, not much attention has been given to the transformations caused by them. However, UVC radiation is used heavily in municipal drinking and wastewater treatment plants for water disinfection from microorganisms. Given the increasing usage of carbon nanotubes (CNTs) and their potential release into water systems, Julie L. Bitter and co-workers of John Hopkins University, Baltimore in USA have conducted a thorough investigation on the transformations occurring on oxidized multiwalled CNTs (O-MWCNTs) upon the exposure to UVC (254 nm) irradiation. Samples treated under large batch volumes were used in characterization studies and mass loss measurements while the latter was used in particle sizing and concentration measurements. Furthermore, the effect of water quality parameters was investigated by varying the solution pH and the ionic strength. The results indicated that O –MWCNTs surface undergo decarboxylation inducing aggregation causing the particles to settle out of the solution. This process was found to be dominated by one photon, direct excitation mechanism instead of the mechanism mediated by reactive oxygen species. Surface characterization with XPS analysis as well as chemical derivatization showed a significant reduction in the distribution of oxygen-containing functional groups upon irradiation, supporting the above observation. Furthermore, it was interesting to note that aggregation was resisted until a sufficient number of carboxylic acid groups were removed where the electrostatic repulsions between the O-MWCNTs were no longer strong enough to prevent aggregation. This UVC induced aggregation was observed at all the light intensities and under both oxic and anoxic conditions. 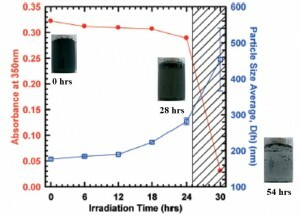 The resistance towards photo-induced aggregation however, was enhanced under high pH and low ionic strength conditions.